These .45 Auto rounds from Military Ballistic Industries (MBI) are a great choice for affordable range work and plinking. 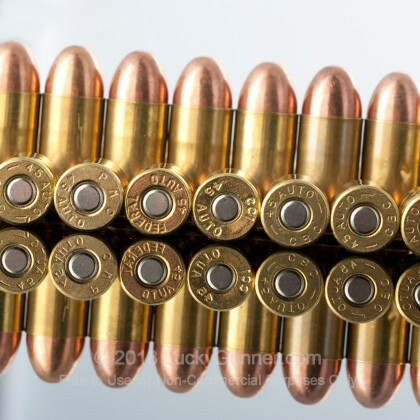 Each of these cartridges is topped off with a 230-grain plated round nose projectile from Berry's which has been double-struck to prevent shedding and provide smooth travel up any feed ramp style. 230 grains is the staple weight for .45 ACP and represents surefire function in full-size pistols alongside a smooth cycling impulse. Since it matches the majority of practice and defense loads in the caliber, shooters can expect this cartridge profile to maintain a familiar relationship between aim and impact. Other components used include clean-igniting Boxer primers from CCI or Winchester, time-proven propellant from Hodgdon, and fired brass of varying origin. Each brass casing is meticulously inspected for nicks, burrs, and cracks before being tumbled and reformed. MBI’s stringent quality control process ensures each round is safe to fire before it ships out. Their products are highly valued for their inexpensive cost and hold high favor among numerous law enforcement training facilities across the United States. Military Ballistics industries is a US-based company that provides high-quality remanufactured training ammo for civilians, law enforcement, and military. You might think of remanufactured ammo as the reloads that your buddy make in his basement. Well, you can forget about that because MBI makes their ammo pretty much the same way any other factory ammo is manufactured. All of their components are carefully selected from top notch companies like CCI, Winchester and Hornady. They also use state-of-the-art electronic loading machines that provide the same consistency and quality as factory-new ammo. The only difference is that the shell casings have been used before. MBI cartridges utilize a once-fired brass or nickel-plated brass case that usually come from law enforcement shooting ranges. Head stamps are mixed and come from a variety of manufacturers, but they're all checked for defects before being reloaded. 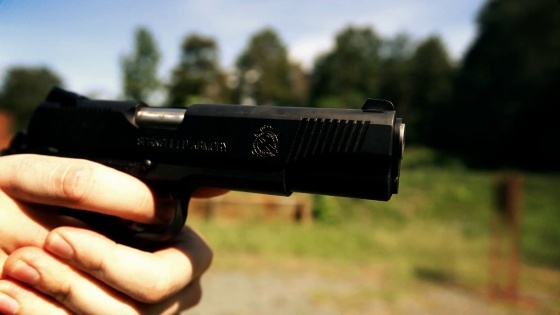 The MBI load we tried out for this review was the 230 grain 45 ACP. The bullet is copper-plated with a lead core. Plating is very similar to a copper full metal jacket except that plating is a little thinner and not the best choice for ported barrels. 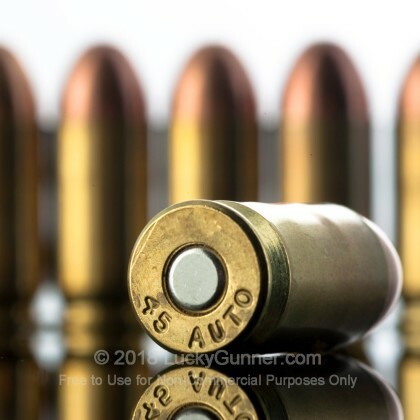 For any other guns, it works just like the more common jacketed ammo. We used six different handguns for this review to check out how the MBI load would perform. We didn't run into any feeding problems or ignition failures, and each handgun went through the ammo just like it was a brand new factory load. Recoil was right on par with most of the other 45 practice ammo that we've used, which makes MBI a good choice for its intended purpose as a low-cost training ground. Accuracy was tested from the bench at 15 yards using a Springfield XDm. Eight of our ten shots hit dead center, right around our point of aim. And the two fliers can probably be dismissed as shooter error. This MBI load is some of the most affordable 45 available. And for that you get great accuracy and consistent performance. With reloadable brass cases, this ammo starts to look good even next to some of the more traditionally popular domestic brands. If you have any doubts about the quality of MBI, there are lots of positive customer reviews on the website. So be sure to check through all of the MBI handgun calibers to see what other people are saying. I purchased 1000 rounds of this ammo and had a 40% failure rate. Attempted to contact the company to no avail. I strongly advise gun owners NOT to purchase this company’s ammo. Extremely dissatisfied and disappointed with the product and will forever tell people to refrain from buying from this company. I bought 5 100 round bags. Haven’t had problems with my 1911 until shooting this. Haven’t made it through the first bag yet. This ammo made my question everything about my gun. After a lot of wasted range time I figured it was the ammo. Gone through 200 rounds so far and no failures. This ammo is dirty, but that's not a problem if you're like me and enjoy cleaning your guns. Will pirchase agaain. Good stuff. Pulled the trigger on 455 rounds with 3 that's right THREE misfirers . Not dirty, easy cleaning and works great with my Springfield 1911 Range Officer. I've shot over 500 rounds, NOT one FTF, FTE, or a dud round. Great stuff. A great number of FTE, FTF in my Sig P220 .45. My last outing (with a just cleaned and lubed gun) about 25-30% were a problem ejecting. I'm generally satisfied with ammo I received. I've gone through about 500 rounds of the 1000 that I bought. Very few misfires. Bought 1000 rounds and it has been great never any misfires. I have recently purchase this kind of reload ammo from this company. I honestly have not had many issues with it. Great clean burn when fired upon and relatively cheap to buy and stock up great stuff. You will get a dub cartridge but over all great ammo. I've had a few misfires with my Kimber. The new rounds didn't load into the chamber, but I relate the problem to the gun being new. I'm sure everything will be fine. Been buying this ammo for quite a while now & I've never had any problems firing it from any of my 45's ... SIG, HK or KIMBER. Good price and the ammo works well - no feeding, ejecting or firing problems. I'm on my second batch of 1000 rounds, not a single misfire, failure to feed, or extraction problem. By far the best ammo I have come across to take to the range and practice. Do not hesitate to buy this ammo. Clean, reliable, and accurate. Cannot beat the price and service from Lucky Gunner. No hiccups whatsoever through my new G21. Love MBI loads for range shooting. As expected for the price. A few rounds failed to feed, it shoots a bit dirty but for the price, what do you expect. I will most likely purchase again depending on what is on sale at the price point. As for the shipping and customer service, top notch! I just got my first handgun not too long ago. 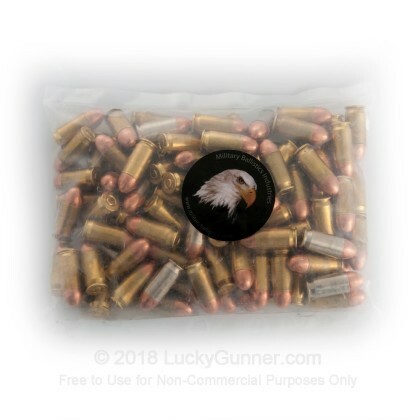 Looked for cheap ammo with good reviews for the range. Found MBI and took 200 shells the range. No failures what so ever and gun was cleaner than when it shot only 50 rounds of Remington UMC. I continue to purchase this ammo because it shoots well and is fairly clean. Great target ammo and a great price. Excellent as always! Received before I even had a chance to check status. Have fired over 700 rounds and plan to purchase more of this ammo. Really great product and the Luckygunner team treated me like a friend, great experience. I'm about 1/2 way done with my 1000 pack. All shot from my Wilsons. Every round fired without issue and they appear to be nice reloads. My only issue is the consistency of accuracy. I'll have the tightest little group at 5 yards and then a whopper that was actually a good shot but tumbled 5 inches off. Those rounds sound totally different when fired too. 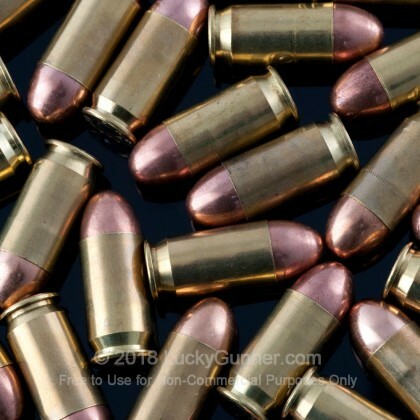 It's decent ammo and not much dirtier than others. It does the job for high volume private range training, but I wouldn't pay a penny over 300. On sale, I'd buy again without hesitation. My handgun is a Sig Sauer 1911 c3. I’ve never known it to be finicky, and in fact have had a great experience with most non-reload ammunition. This is my first experience with any reloaded ammo. I took a 100-rd bag of this ammo to the range. At least three of the rounds had bullets that were seated too far into the cartridge, causing it to bulge about a fifth of the way down and resulting in failures to feed. Those were complete failures to feed even with a little bump to the back of the slide, so we discarded them. Additionally, there were a few instances (2, 3 at most) in which the slide wouldn’t move forward all the way on its own, but all of these were easily resolved with a bump to the back of the slide. These rounds were fired and their shells extracted without issue. Other than this issue, we seemed to hit our targets pretty accurately, and I’m . Other guns with looser tolerances would probably be fine. I've shot over 2500 rounds of this (.45 and 9MM) with only 2 FTFs. Accuracy is better than I expected. You will not find a better price per round that I have seen. I highly recommend this ammunition for basic practice. I gave fired around 100 rounds through my kimber super carry pro. No issues. Will be buying more! Shot up over 100 rnds. with no problems. Great value.. I had 1 FTBattery in a 1911 which is way better than usual. Great value.. I had 1 FTBattery in my new sig saucer Scorpion 1911 out of 200 rounds. a good buy for the price. A good company to do business with, and fast delivery. The 45 ACP - 230 gr FMJ - Military Ballistics Industries performs great. Excellent value. All has been as described, very happy with performance. The 1000 rounds of .45 ACP 230 grain FMJ from Military Ballistics Industries is a great value for the money. It may burn just a little dirtier than premium ammo, but for the price I haven't seen anything better. I've never had a problem training with it in my Glock 21. This ammo runs in my glock, para ordnance, colt and .45 carbine. Planning another order. I have always been apprehensive regarding the use of reloads. I finally broke down and purchased MBI. When I went to the range to shoot, out of the first 50 rounds, seven were struck on the primer but did not go off. This constitutes nearly a 15% failure rate. Needless to say, I was quite disappointed. This is some great ammo !!! Went through 500 rounds of MBI at the range this morning. I have been shooting everything from Armscor to Zombie Defense - and Military Ballistics is right up there with the heavy hitters. I have fired this ammo for hours on end, without a single issue. I absolutely love this ammo !!! My STI is very picky most of the time. I have fired well over 1000 rounds without a hiccup. Works well, brass and bullets are clean. I have been buying this ammo now for at least a couple off years. Never had any type of problem with it feeding, ejecting etc. great range ammo. The only thing that disappoints me is the price. I am shooting it through a Stainless Pietta 1858 Target revolver with a 5 shot conversion cylinder and it works just fine. I removed the barrel and chamfered and polished away the sharp edges where the bullet enters the barrel and using some kydex, made a grip that wraps around the normal grip and fits and supports the hand. I also extended the kydex to support the forearm. I silver soldered a piece of brazing rod to the front sight to raise it 0.150" as it shoots high with 45 ACP. I am shooting silhouette steel targets at the shooting range and it makes a nice "klong" sound when it hits. With an 8" barrel and an 11" sight picture I seldom miss which annoys the semi-auto shooters as I am "klonging" a lot and they are not. I have a bunch of pistols but this has turned into my favorite. Shooting 5 shots at a time it takes a while to go thru 100 rounds so lots of fun for little money. The prices were the best I could find and the service was very good! I have put 2000+ rounds through my Colt 1911 and 2000+ rounds through my EAA SAR K2 and every round fired. If you want the best ammo for the price and performance then by all means purchase this ammo!! I can only say that this is the best range ammo EVER!!!! Thanks Lucky Gunner. You are the BEST!!!!! If you had the choice between new ammo, Or Reloaded ammo which would you choose??? Obviously NEW, BUT when you ask the same question with NEW Steel cased ammo, or Reloaded Brass... I'll choose brass, Just because of it's proven functionality. This having been stated, You can't beat this stuff for the price. I've put 300 (+/- 20) out of my FNP 45 ZERO FTE's, Or FTF's. Given that's not a real break in, It's better than Zero, N' just makin' speculations. The most important thing is that... It's at the RIGHT Price... Must I even state how important that is? Is there any reason to choose Other Bulk .45 ACP FMJ ammo? No. I have shot 325 rounds and no misfire and every one loaded without any problems. It is the cleanest burning round I have every fired. Will purchase more as soon as I burn thru this 1000. All great stuff. My Glocks eat it up BUT. 75% of the time it wont lock back the slide. Will continue to buy because I like cheap ammo for paper! I was searching for a high-performing range ammo while trying to keep costs as low as possible as I became familiar with a new handgun. I first ordered 100 rounds to test these in my new Springfield Armory XDm .45 compact and was impressed enough to follow up with a 1000 rd order, which arrived at my doorstep so fast, I was impressed.. Lucky Gunner rocks! Anyway, I've since fired about 800 rounds from the XDm without a single failure and any inaccuracies during target practice were my fault! Never a question in mind what ammo I purchase when I'm looking to arm up. I've gotten these rounds before when a family member purchased them and I was so impressed I came back for more. You can't beat MBI's quality and, while the price is climbing slightly, the price. I never have light loads, ejection issues, and they're definitely cleaner than most other bulk ammo. Only thing I'd ask for would be that there's more in stock to purchase more often! Great price - great value! I put 200 rounds through my Glock 21SF - not a single FTF or FTE. This is the best ammo for the range - gives you plenty of "solid, reliable bang for the buck!" Great product. I will be back for more. Fired the first 100 rounds of my order through my Kimber 1911. Had one misfeed - which has never before happened with this particular weapon. During cleaning I noticed that it was dirtier than usual. Had been using Speer ammo before. MBI saves some money and is adequate for the range. I would only use it on the range but carry Speer Gold Dot JHP for concealed carry. Have shot around 200 rounds through a Taurus 1911 and had no trouble at all. A lil dirty, but the gun is stainless, so grime shows easily. A great overall value. I had great experience with this company's .38 Special ammo, so I decided to try the .45 Apc product. I was disappointed to see that I got far too many stovepipe feeds in my Kimber with Wilson combat magazines. I love this stuff for the range, but consider it a liability for personal prpotection. Only problem was a single bad primer out of 2000 rounds. Powder is a little dirty, after 200 rounds front site needs to be cleaned. Great value for the money. I'll be a return customer and have already referred friends to the website. I'm happy, that's what counts, right? Overall the ammo is great only minor issue is that there's a lot of particle blow back. Great ammo. Great price. Could not be better unless it was free. Quick shipping and cheap shipping. If you want a great deal, BUY THIS AMMO!!! After firing only 200-300 rounds, my Glock 30 is very dirty and I had a handful of FTF's. I've used thousands of rounds of the same brand in 9mm 115 grain in my Sig Sauer 226 with none of these problems. Go figure. I will update on MBI's performance in my Glock 19. Maybe it's the brand of weapon, maybe it's the caliber. Keep you updated. A couple hundred rounds through a Glock 30 with no problems. I bought this ammo for a plinking round while I built up a reloading base of good brass. I may just keep buying this stuff and not reload 45 ACP. For practice that is! This is my third purchase from Lucky Gunner and they are great!!! The .45 ammo has been great a 1000rds through my Springfield 1911 and not a problem one. Getting ready to order more. stockpile this for uncertain future. Shot a couple hundred through my R1 1911 fires everytime. Decent powder great trusty load. No problems with my Taurus 24/7 Pro but they are pretty dirty noticed it after about 40 rounds. Out of 5000 rounds, only two were defective. All my shots were very accurate, and the price was great! I've got ~300 rounds through my custom built (by me) 1911. Love it. Cheap, clean, no problems so far. I have Para Ordnance .45 and kept having FTF problems. To verify it was the ammo I used the last of my Magtech in two clips and had no problems. These feed through my XD Service model just fine, only one jam through 300 rnds so far. These are extremely dirty in my opinion campared to the PMC's i ran through it three weeks earlier. I'll problably get the 1000 rnd PMC's next time because there cleaner and only $20 more than these reloads. I have purchased 3,000 rounds so far and after the two FTE's - which I do not think was the ammo - the only problem was one squib. Hmm....3,000 rounds - one squib. I am not a math wizard but - good in my book for reloads. Crap I know a guy that has had multiple squibs in factory brand new ammo. I will be buying more. good for the price. half the bags broke open during shipping. yippie for 500 loose rounds! otherwise they are good for the price, but burn a little dirty. This was my first order from Lucky Gunner. The service is excellent. I ordered 1000 rounds and fired about 400 rounds. They cycled flawlessly. No squibs, I shot it through my "Tommy" 30 round clip. The only issue I found just like one of the other reviewers was that 4 of the sealed bags had broken open. Couldn't be happier.... 45 ACP Heaven !! This was my first order from Lucky Gunner. The service is excellent. I ordered 1000 rounds and fired 300 so far. The .45's cycled flawlessly. No squibs, FTE's, or FTF's in my Kimber Pro. Every rounds performance felt even. The only issue I found was that 2 of the sealed bags had broken open during shipping. No real issue but MBI could do a better job of sealing the bags. You cannot find a better value than this and I will be ordering rounds in other calibers very soon. This is my second batch of 1000 and only three problems so far, one squib, and two FTF's - found the FTF problem - it was not the ammo. Feeds great, shoots consistent, and I recommend it for shooting any non-defense purpose. This ammo is a great value and considerably more reliable than green shell ammo. The only problem I had was that when I recieved my order the box was broken open and I was missing a considerable amount of ammo. But LuckyGunner customer service was great and the replaced the missing rounds in no time. Of the 1000 rounds MBI reloads I recently purchased, I fired 75 rounds through my Glock 21 to date, with the exception of one misfire, so far the ammo worked flawlessly. On the misfired round, the primer had been dented, it did not fire. I did not attempt to refire the round. I removed the bulled and put the spent brass in the reload bin. Given the price, I guess a 1% dud rate is an acceptable cost of shooting reloads. My Kimbers, Colts and Glocks love this stuff and I can recall no problems at all after hundreds of rounds in matches. Great value, although I am compelled to hawk brass when I shoot this stuff. High quality military reloads. Excellent value, has my confidence. I took 5 bags of 100 rnds and ran through 200 with only one bullet issue - a mangled round... for the value, not a big deal at all. In terms of confidence in the product, I had no issue with Kimber 1911 ProCarry II, Colt New Agent nor SIg P220 - all ate through it just fine... I'm buying more! I recenly bought this ammo form the 100 round section, it's a great ammo but this time I have to give a quality rating of 4 instead of 5 because one round out of 200 was a dud, primer was struck many times over but the round never left the chamber, it happens I guess... from the reloads, still good ammo though. Having read the highly rated reviews of this ammo, I took a chance on the 1000 round offering. I hoped for the best, and was pleasantly surprised. This is great shooting ammo in my FNP-45. Not one problem through the first 200 rounds. I'm going to hoard the rest until I can get more. With gold prices going so high, your best investment is in lead, and this is an outstanding investment value. I bought a 1000 round package of these. The delivery time was awesome. Just 2-3 days. I shot 200+ rounds so far in my Glock 21 and no misfeeds. It's great for practice at the range. I will definately buy more in the future! 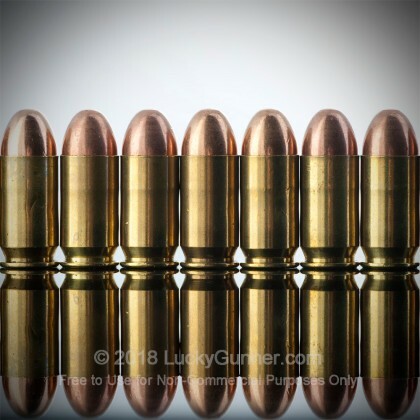 Most reviewers appear to have had zero performance issues with this ammunition...I average a failure rate of about one light load per 80 rounds. (By light load I mean not enough power to cycle the slide). I have experienced these failures in a full size Sig, and both a full size and sub compact Glock...so I cannot blame pistol manufacturer or size of firearm. I would make this purchase again. The cost of the MBI rounds far outweights the inconvenience of manually chambering a round every few magazines. I shot 400 rounds for the first time, using a Colt 1991a and Colt Series 80 Officer's with 10 different magazines. The only problem was with the Officer's -2 FTE's. I did not track my mags (oops), so I am not certain if it was a mag issue or the ammo. I think it is one of my mags and have already recommended this ammo to others. Plus I'm planning to buy more. 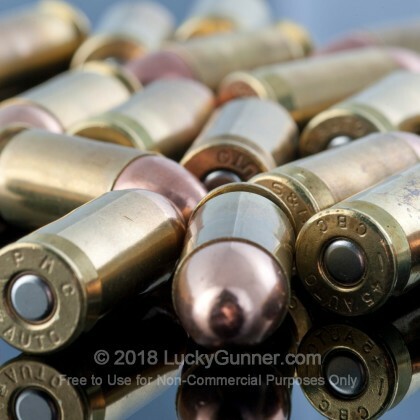 Final point, I do not buy ammo that I think is a problem and at this price it is great for practice, (I loved the other guy’s expressions at the range when they started to notice how many casings were laying at my feet – they were shooting far less than me. ), or whatever else use you might need. This ammo worked perfectly through me Glock 30. This is the second batch of this ammo that I have put through my Glock 30. It is great ammo for practice at the range. No failures shooting 2000 rounds. Great deal for the money. Shot over 1000 rounds of this stuff without inspection through my TA-5 Thompson pistol with both the 50 drum and 30 round mag. Not one problem. Love it. Even bump fired it with this ammo and it spit out 50 rounds of this ammo in about three seconds no problem. My 1000 round 9mm batch of this stuff was also flawless through my Sig. Will by this until it no longer works for me, and at this price why not!! Especially since 1000 rounds end up on the floor every session!! I bought the 1000rd pack based on the product description. These have run flawlessly through by Charles Daly 1911. No failures at all. Who says remanufactured won't work in a 1911? At about $19.25 per 50 you can't beat the price. Q: Is the ammo magnetic? A: Hello Bob! The MBI is manufactured with a brass case and uses a copper coated, lead core bullet. This round will not be attracted to a magnet. Q: The thjn plated bullets are not hard on our barrels are they? A: Hello Doug, The jacketing on these 230gr. FMJ rounds by MBI in .45 ACP is perfectly safe for your firearm. You won't have any problems with jacket separation with them. A: Hello Doug, These 230gr. FMJ rounds by MBI in .45 ACP are not hard on your barrel at all. They will function great in your .45 ACP firearm without any difference in barrel wear than any other copper jacketed round. We also have this 45 ACP - 230 Grain Plated RN - Military Ballistics Industries - 100 Rounds ammo in stock in a smaller quantity.